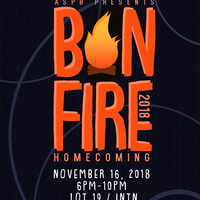 Join us for this year's Homecoming Bonfire where we'll be burning the opposing team's mascot in a massive Bonfire! Bonfire and fireworks were cancelled and nothing was made up for that, only one ride. In n out ran out of food before the limit and I stood in line for an hour for no reason.